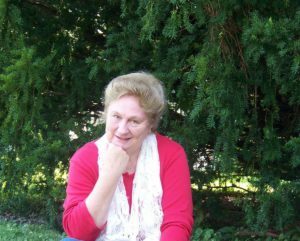 Caroline Gibson is co-owner of Undiscovered Treasures, a shop of antiques, collectibles, and junk in rural West Virginia. Inside the shop is a music box that Caroline particularly relates to, believing that her own life is similar: forever spinning and never going anywhere. She dreams and prays for the right man to turn up. But when family and friends hint that the local artist could be the guy, Caroline forgets about trusting God and takes matters into her own hands. Besides, she could never love a man who paints such depressing pictures. Andrew Carrington, painter of said depressing pictures, insists there’s always one redeeming trait to each of his works. He’s loved Caroline since they were kids and thinks he’s not handsome enough, strong enough, or rich enough to impress this woman. But when God—or is it?—suddenly sends contracts begging for his signature, Andy thinks this just might be the way to win the only woman he can ever love. Caroline is waiting for the perfect guy even though he’s right under her nose. This book has mystery and romance. Andy puts up with more than most men would which makes him an outstanding guy. This book is the third in a series and I did feel like I was missing some information, but nothing that was pertinent to the story. It was kind of like when you’re in a group setting and everyone else has known each other since high school. You’re kind of on the outside. However, I’d guess if you read the first two books, you’d feel like you’d known them for years. The plot is well-written with realistic characters. I will admit that I had a hard time warming up to Caroline. She says what she thinks and it comes across as judgmental, but as you get to know her, you see there’s more to her. The beginning also felt slow moving, but it picks up speed. If you’re looking for a cozy mystery with a hint of romance, this book is a great fit. I was given a complimentary copy of this book in exchange for an honest and fair review. All opinions are my own. Why did I write this book? Several years ago, my agent urged me to write a romance novel for a certain publishing group. I did, and while I was at it, decided to write about three friends, all living in the made up town of Appleton, WV. Each had their own story, but the romance books didn’t go anywhere (because I’m not a “per se” romance writer. But when a current editor asked me for a new series, I thought about these three books and wondered if I could turn them into light mysteries. Ta da: the Appleton, WV series was born! How much of myself do I put into my books? Almost always little dabs of this and that. I love antiques and flea markets, cats, flowers (including Caroline’s favorite: daisies) and coffee. If I drink tea, I’m a Tea Snob (same as Caroline). I’m clumsy and fall over practically nothing (Caroline too!). What is your main characters like? 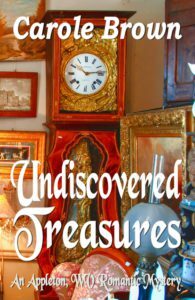 In Undiscovered Treasures, Caroline Gibson, is a “home-town” girl. She doesn’t have a lot of confidence in her own looks, is clumsy, and sometimes quite outspoken. But she’s loyal, trustworthy, and soft-hearted, always watching out for the “underdog,” helps her brother run a successful business, writes plays, and oversees the local youth organization at her church. Andy Carrington, on the other hand, is quiet, but confident in his own abilities, friendly, a dedicated Christian, and an up-and-coming famous artist. He’s best friends with Caroline’s brother, and grew up with him and Caroline. Best of all, he’s loved Caroline forever and trusts God to direct his and her life. Where did I get the title for this book? When I plotted for the third friend (Caroline), I decided a junk/antique/collectibles store would be fun and unique. It also fit her personality. Having a brother and sister run the store worked well with the plot and giving them both a bit of wittiness added interest to the novel. I also thought this title played into the emotional love story part of the plot. Caroline, always dreaming of a real live prince for her life, doesn’t realize that she already has one. It’s only when she discovers Andy’s virtues that she finally clasps the truth: Andy is her treasure, chosen by God, just for her. Why a cat in the story? It played into Caroline’s personality very well. I can just see her volunteering at the local pet shelter. Angel, the cat, also was a ready (or not) listener when Caroline needed a sounding board. How does the music box play into the plot? It’s a constant reminder–and not a very welcome one–that her life is somewhat unsatisfactory. She thinks it’s because she doesn’t have a “prince” riding up to save her from a mundane existence, but really, it’s more like the proverbial ostrich inserting his head into the sand, and unwilling to accept the will of God for her life. Why have Caroline travel out of the U.S. when she’s such a homebody? Having her travel, which she isn’t totally fond of, forces her to climb out of her comfort zone. She knows what she has to do–make an apology–whether everything turns out the way she wants it to or not, and because she has to travel a distance, she has plenty of time to ruminate on her “follies.” Overall, a good disciplinarian action for her. Is there a spiritual thread? Yes. Accepting God’s will for our lives. We can’t make things happen the way we want, and if we force the issue, most times, it turns out to be an unsatisfactory situation. Caroline has to learn that, and once she does, she couldn’t be happier.